So the milk I grew up with was very much like the milk my parents grew up with–raw, creamy, unpasteurized, rich [we had to skim off the cream, and still we had to shake the milk to mix it up!] 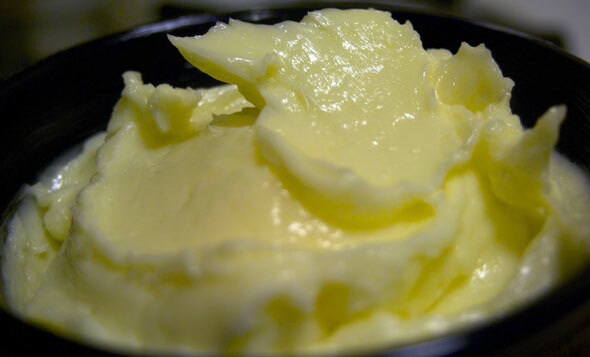 I remember my Grandma Myers and my mother telling me about making butter in their youth. Grandma, especially, held no fondness for those days, at least as far as making butter and bread from scratch all the time, but I confess, it seemed romantic to me. Romantic in that “Little House On The Prairie” kind of way. Of course, it’s easy for me to romanticize such things–I don’t have to make bread or biscuits or butter every day. I have supermarkets and amazing bakeries within blocks of my house. But when my Grandma passed away and most of that farmland was sold, I found myself longing to keep a piece of that history with me. Oh, yeah – REAL buttermilk (not the cultured stuff in stores) is pretty wonderful stuff. Use it in recipes [like my Savory Bacon Cheddar Biscuits] just as you would its modern cousin, or drink it straight. As a drink, it’s nothing like the cultured stuff–it’s fresh, just slightly tangy, and not thick at all. Delicious! Recently, my sister took my mom and cousin with her to a cheese making class, and (among other, more cheesy, items) they made butter by hand, and by hand I mean they used a KitchenAid stand mixer. Orville and I looked at each other, and I could see it in his eyes that we had to do this. Turns out, it’s SIMPLE! If you have a stand mixer, it’s practically a no-brainer: put a quart of heavy cream in the mixing bowl, turn on the mixer, wait until it turns into butter (and buttermilk.) Really. That’s all there is to it. Just turn it on and wait. When it gets lumpy, drain off the buttermilk (ok, that takes a little massaging), and then spread and enjoy! The whole process takes about 15-18 minutes if you use pasteurized cream–much less time if you can get less processed cream. To prove my point, I give you the recipe in a video! From my family of farmers to you, I give you fresh butter and buttermilk. This worked so well. It was so easy and came out tasting delicious. I threw in some fresh chives and some garlic – so good. I used to teach my 2nd and 3rd graders science by making butter. Same way except each kid had a babyfood jar and I would put on some music and they had to "shake, shake, shake". I guess I could have called it P.E. as well. Thanks Bri!! !